dScope Series III Version 1.2x releases feature the capability of connecting directly to Windows Sound Devices, both for generation and analysis. dScope Series III can use a Windows soundcard or audio interface directly as a generator source. 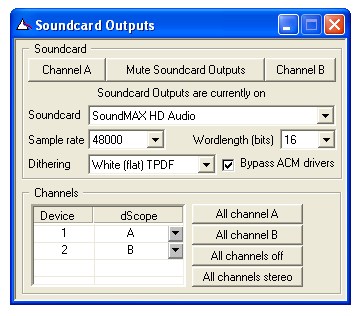 The "Soundcard Outputs" dialogue box (shown below) has a drop list which lists all the available sound cards on the computer, from which one can be nominated as the output for the dScope Generator. This may be useful in a variety of situations: for example it opens up the possibility to use dScope with almost any media interface, for example MADI or Ethernet audio, as long as a PC card and Windows driver are available. It also enables the testing of Windows sound devices themselves, such as Bluetooth headsets or FireWire audio interfaces, since the dScope can access both the host and outside-world audio ports. Once a soundcard is selected, the dScope's two-channel Signal Generator feeds the nominated device, as well as continuing to feed the dScope's Analogue and Digital Outputs in the normal way. The dScope's two output channels can be mapped to multi-channel output devices in any combination. There are also quick buttons to accomplish some common mappings such as dScope channel A to all output channels. The sample rate and wordlength of the signal sent to the soundcard can be set to any combination allowed by the nominated soundcard. Note that in some circumstances a soundcard's driver may claim to support sample rates or wordlengths which the soundcard cannot natively support. This situation can result in sample rate conversion or truncation happening 'behind the scenes', often with a bad effect on signal quality. If the 'Bypass ACM drivers' check box is checked, Windows is instructed to pass the audio directly from dScope to the soundcard driver - the driver itself may still change the audio data, but this is beyond dScope's control. If enabled, ACM (ACM = Audio Compression Manager) drivers are applied invisibly by Windows to perform format conversion in situations where the soundcard's native capabilities do not include the parameters of the audio being played out. When generating or analyzing using soundcard I/O, the amplitudes of audio samples transacted with the soundcard are treated in exactly the same way as with the dScope's Digital Inputs and Outputs. That is to say, a signal at 0dBFS corresponds to the maximum amplitude of the soundcard. For information about using D/A line-up to express analogue amplitudes directly when using soundcards, see the "Amplitude units in dScope" help topic in the dScope help files in the "soundcard Generation and Analysis" section. As with generation via a Windows Sound Device, the dScope is also able to use the signal from a soundcard or audio interface as a source for analysis. The "Soundcard Inputs" dialogue is shown below. The 'Soundcard' drop-list allows any of Windows' installed sound devices to be selected as a source for analysis. Choosing the 'Windows Sound Mapper' option uses the default soundcard as selected by Windows. Once a soundcard is selected, the dScope's two-channel Signal Analyzer can be selected to analyze the soundcard's inputs using the input selector on the Signal Analyzer dialogue box, or the "Soundcard Input" icon on the Main Toolbar. The two dScope analyzer channels can be set to receive their signals from any of the available input channels of the nominated soundcard. This facility is especially useful in the case of multi-channel soundcards. Because the dScope Signal Analyzer and Continuous-Time Detector results are calculated in DSP in the dScope hardware, and the signal from the soundcard is not sent via the dScope hardware, these instruments are not available for soundcard based analysis. Instead, all the measurements are done using buffer based measurements and FFT analysis. This means that the Scope trace, FFT trace and FFT Detectors are all available, but not currently the Signal Analyzer or Continuous-Time Detector. Testing a USB microphone pre-amplifier previously required routing the signal back from the host computer to the dScope using a sound card with a digital output and a custom DLL to route the audio within the PC. As of dScope version 1.2x, the signal from the device can be analyzed directly in the host computer. In practice, the test is scripted so that the EUT (Equipment Under Test) is connected first to the dScope analogue outputs then to a USB port on the host computer. The dScope script detects the presence of the new sound device, typically within half a second and commences testing. Using a multi-tone test dozens of test parameters can be tested in a couple of seconds and a pass-fail given. The script can also automatically log the test results and keep statistics. The operator doesn't even have to touch the computer as detection and pass/fail is completely automatic, with a typical device test being completed in around 6 seconds.